Bangkok is again recovering from the aftermath of a military crackdown on peaceful pro-democracy protesters. A state of emergency was declared on 7th April and, three days later, the army opened fire on the UDD protesters who had gathered around Democracy Monument since March. Twenty-five people were killed. The protesters then intensified their demonstrations, establishing city-centre protest camps at Siam Square and Sala Daeng. On 14th May, the camps were surrounded by armed soldiers, leading to a week of street battles between soldiers and protesters. Public transport in Bangkok remained closed throughout the week. The army fired live rounds, and the areas around the camps were designated as 'live-fire zones' by the army, with military snipers carrying out a shoot-to-kill policy. Thirty-nine people were killed. On 19th May, armoured personnel carriers were dispatched to demolish the camp at Sala Daeng, and soldiers then began advancing on Siam Square. 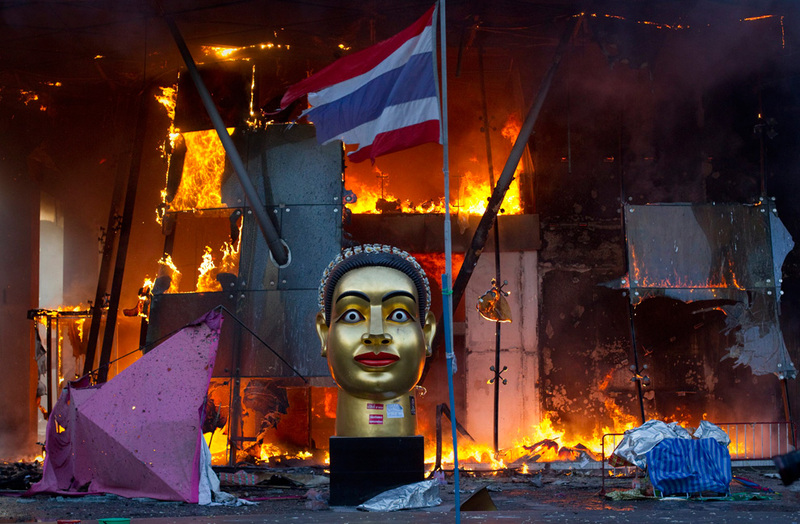 The protest leaders surrendered, and most protesters disbursed, though arsonists set fire to Siam Theatre, CentralWorld, and several other buildings. The King, who had intervened during the Black May massacre of 1992, made no statement. Even the Prime Minister remained at army HQ and made no public appearances. A total of eighty-five people were killed, a death toll exceeding the most notorious military crackdowns in modern Thai history (October 1976 and May 1992). However, anti-UDD government propaganda (portraying the protesters as violent terrorists), and censorship of UDD media, have prevented a widespread public outcry against the military. The Royal Thai Army has extended its tentacles into the media (Channel 5 and Channel 7), politics (the 2006 coup), and the Privy Council (General Prem). The army is essentially a law unto itself, and it's highly unlikely that anyone will be held accountable for the military massacre.